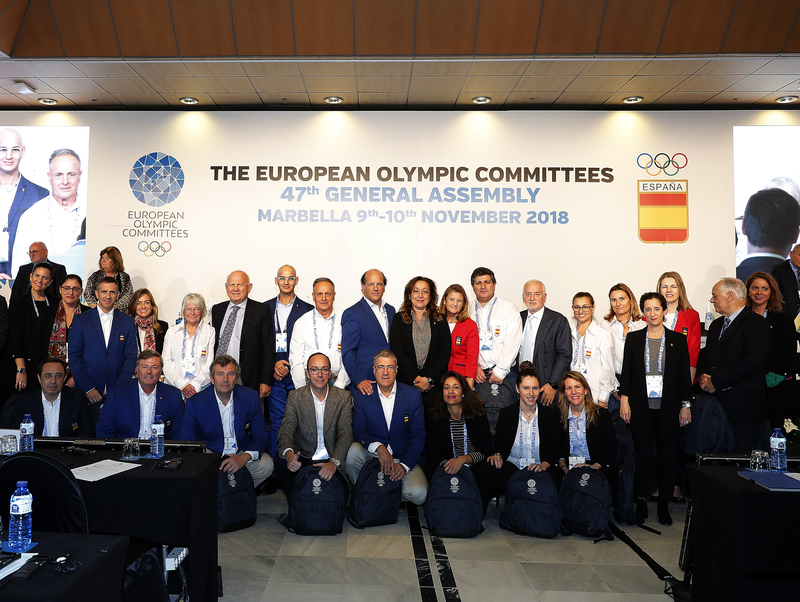 The 47th General Assembly of the European Olympic Committees (EOC) wrapped up today in Marbella, following 2 days of discussions. Debates also included a presentation on the New Leaders sport leadership programme by the Finnish Olympic Committee, which aim is to balance men and women participation. A call for participation was issued to all 50 ENOCs and 51 applications (36 females, 15 males) from 27 countries were received. In the end, 30 participants (19 women, 11 men) from 25 countries were selected for the programme. “As Chair of the EOC Gender Equality in Sport Commission Sarah Keane correctly mentioned yesterday, we need to educate men and women equally to advance gender equality,” said Finnish Olympic Committee Secretary General Mikko Salonen. More information on the New Leaders programme can be found here. A report from the World Anti-Doping Agency (WADA) was also delivered by the Director of the European Regional Office and IFs Relations Sebastien Gillot. The 2018 European Olympic Laurel Awards were presented to Peter Schröcksnadel (Austria), Emmanuel Katsiadakis (Greece), Ellert Schram (Iceland), Jean-Louis Margue (Luxembourg) and José Vicente Moura (Portugal) for their outstanding roles in promoting Olympic values and ideals in Europe. The 48th EOC General Assembly will be held in Warsaw from 25-26 October 2019 following a presentation by the Polish NOC and approval of the General Assembly. The meeting will coincide with the Polish NOC’s centenary celebrations. EOC President Janez Kocijančič brought the General Assembly to a close by thanking the Spanish National Olympic Committee and all the volunteers for their hard work and dedication in delivering an excellent event.